The 2018 State election date is November 24, and candidate nominations closed on 9 November. We are asking all candidates to sign the Climate Emergency Declaration. 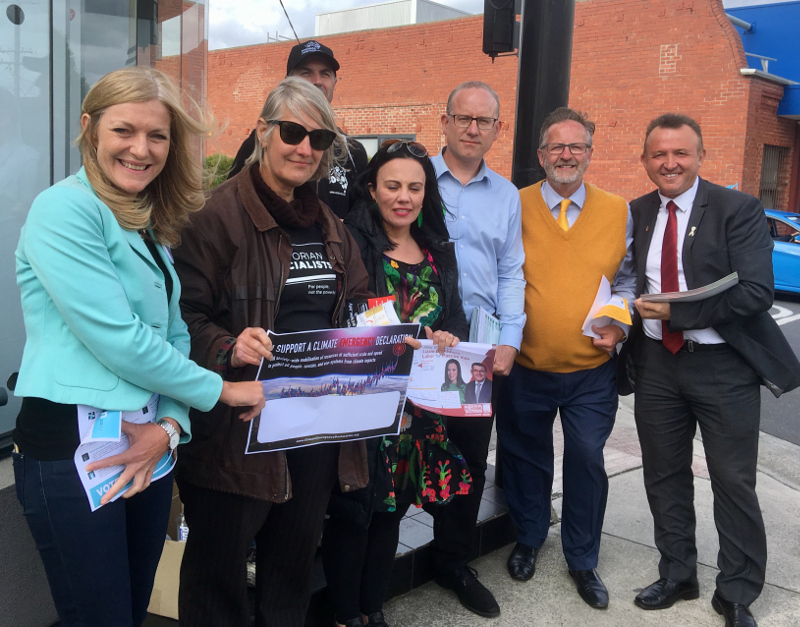 Candidates outside Pascoe Vale Prepoll endorsed climate emergency: Fiona Patten (Reason Party) Sue Boltion (Vic Socialists) both standing for Upper House, Lizzie Blandthorn MP, Phil Jackson, John Kavanagh, Oscar Yildiz, Graeme Linsell. Those who have now signed include: Phil Jackson (the Greens), Graeme Linsell (Animal Justice Party), Oscar Yildiz (Independent), John Kavanagh (Independent), Gerry Beaton (Victorian Socialists), and sitting Labor MP Lizzie Blandthorn. Note: candidate photos below are displayed in a random generated order. Click on a photo for an enlarged image. John Kavanagh and Oscar Yildiz are both Moreland Councillors and voted at Moreland Council meeting in September for Moreland Council to acknowledge we are in a state of climate emergency. The 2018 State election date is November 24, and candidate nominations close on 9 November. With Jane Garrett retiring as the Labor MP for Brunswick, candidates are lining up to contest the seat. We are asking all candidates to sign the Climate Emergency Declaration. Those who have now signed include: Tim Read (the Greens), Christopher Miles (Animal Justice Party), Cindy O’Connor (ALP), Christopher Anderson (Independent – Save the Planet), Catherine Deveny (Reason Party), George Georgiou (Independent). Note: candidate photos below are displayed in a random generated order. Click on a photo for an enlarged image. The Paris Climate Agreement aspirational target limiting global warming to 1.5 degrees is starting to look unachievable. Even meeting the hard target of 2 degrees, which will still result in huge damage (e.g. probable loss of the Great Barrier Reef), will require governments everywhere to lift their game. We are pleased to hear that Moreland Council acknowledged we are in a state of climate emergency at the Council meeting on 12 September 2018. We note Moreland Council’s community emissions reduction policies and targets for 2020 and 2040. 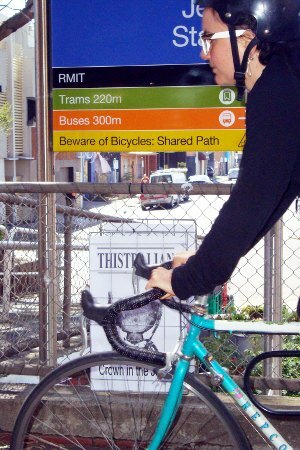 Transport is one of the largest sources of greenhouse emissions, amounting to 25.8 per cent of emissions in Moreland in 2013-14. Governments at all levels need to lift their game. Transport is one of the largest sources of greenhouse emissions, amounting to 19 per cent Australia wide, and 25.8 per cent of emissions in Moreland in 2013-14. Here too, governments at all levels need to lift their game. At the state level we think a major shift is needed in Transport infrastructure funding. In 2018 Roads funding was 69.1 per cent, Public Transport 30.5 per cent and Active Transport just 0.36 per cent. There needs to be a major priority change in this area to meet climate targets. Climate Action Moreland congratulates the election of the Daniel Andrews led Labor Government in Victoria and are hopeful for strong progress on climate mitigation and adaptation programs at the State level with this new Government. We also congratulate Labor MPs Jane Garrett (Brunswick), Lizzie Blandthorn (Pascoe Vale) and Frank McGuire (Broadmeadows) on being elected to the Legislative Assembly to represent the citizens of Moreland. Our thanks to all the candidates who attended our climate forum for the election to explain their party policies and personal views on taking effective action in tackling climate change. These public forums are important avenues for direct community debate. As an active community group we endeavour to have robust discussion and debate on climate action with all our representatives from every level of government: from Local Councillors, State MPs, to our Federal MPs and Senators. We look forward to working and engaging positively with ALL our elected State Government representatives over the next 4 years to bring about substantive action in reducing greenhouse gas emissions and adapting to the impacts of climate change. In particular, as residents of Moreland this means the impact of increasing temperatures and heatwave events and increase in intensity of storm events. 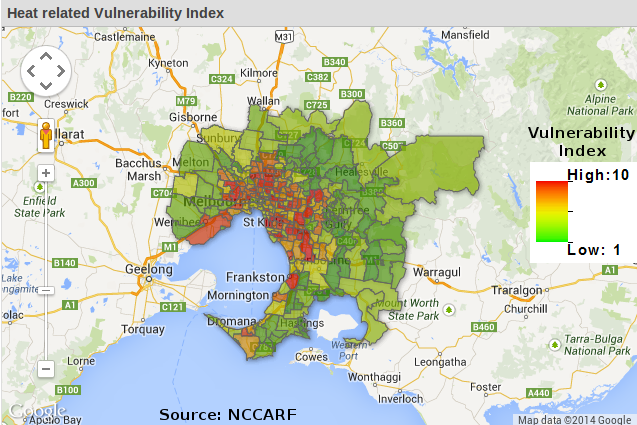 Source: Loughnan, ME, Tapper, NJ, Phan, T, Lynch, K, McInnes, JA 2013, A spatial vulnerability analysis of urban populations during extreme heat events in Australian capital cities, National Climate Change Adaptation Research Facility, Gold Coast, 128 pp. On Monday Brunswick Greens candidate Tim Read was on the Beyond Zero Emissions show broadcast on Monday 24 November. Also on the show was Lily D’Ambrosio, the Labor Member for Mill Park and the Shadow Minister for Energy and resources, Cost of Living and the Suburbs. I have interviewed Tim Read and he has a good knowledge of the impacts of climate change and particularly heatwave impacts on human health which are are more likely to be experienced in heavily urbanised areas with climate change amplifying the urban heat island effect. A recent report tabled in parliament by the Victorian Auditor General’s Office identified critical deficiences in heatwave emergency response. Over 500 people in the last 5 years are estimated to have died as a result of heatwaves in Victoria. During the show Read asked a question of D’Ambrosio. Her response was very inadequate, in which she talked off topic and didn’t really answer the question. We have been given short shrift by 4 years of a Liberal Government, and if this response is anything to go by, we need to educate these MPs that peoples lives depends on good governance and strategic emergency management. Importantly, we need to have good plans in place to manage multiple emergencies at once. When heatwaves occurr, not only do we have a health emergency from the heat, but we are also much more likely to also have bushfires occurring which must be managed simultaneously. Tim Read: I was a bit concerned Lily, and thankyou for coming on the show, about the excess deaths attributed to heatwaves in 2009 and then again in January this year. I am wondering whether a new government, a Labor government, would be interested in improving the state government response, particularly the health response to heatwaves? Lily D’Ambrosio: I am not going to be making any policy announcements on the radio and on the run. Definitely not. But we are acutely aware that the extreme variations in temperatures do have a strong impact, and sometimes a devastating impact on health and livelihood and it is very important that these issues are looked at. That there is a capacity for communities to become more resilient and certainly have more opportunities to protect themselves through heatwaves and cold snaps. We know that with gas prices about to surge to unparalleled levels that many parts of Victoria like Bendigo and Ballarat where it gets very cold and there is a high reliance on gas for heating, that there is going to be some significant challenges there for communities in terms of being able to keep warm. The state Government has done those communities no favours by putting caps on the energy concessions and we are going to be looking very carefully at the impact of that if we are lucky to be elected this coming weekend. Vivien (Compare): I have something to add to that from one of our loyal listeners from Mudgee who sent a text message this morning saying “Can you say on air that Mudgee has broken all records last weekend – 42 degrees – broken all the records they have ever kept. People are really quite frightened of that. This is becoming the norm and how are they going to cope? And I think they do require the State Government to put in place more emergency services, and like places to shelter. I would like to see all the churches open for example, the school halls, so that people, civil society is organised to cope, and it is not just this huge mass of people turning up at emergency departments when they could have been prevented from going there. Lily D’Ambrosio: There is a will, and a great benevolence across our community in greater need, whether it is at times of flood or fire disasters and the like, there is that great willingness. You need to believe the science and accept the science. We need to then aknowledge there is a role to be played, a leadership role at all levels of government and we know that some local governments have been very pro-active, state governments also can be that, importantly too, and the best scenario is all levels of government and all sides of politics to understand that we have gone beyond questioning the science. It is a ludicrous situation where we have debates and we pull scientists into a political slanging match and use them as dart boards. The fact is they are above that. The minute we understand that we will all be the better for it to take the necessary bipartisan steps. Vivien (Compare): I think it is a tragedy that might take us all out. It is so bad. The delay. Lily D’Ambrosio: and that is why programs such as yours are very important, and we need to get on with it and start some pro-active steps to turnaround our situation. That is going to be a big effort, but small efforts can result in big improvements. Why we need to support communities, however small or large their proposals might be at all levels: from community right through to scale projects. 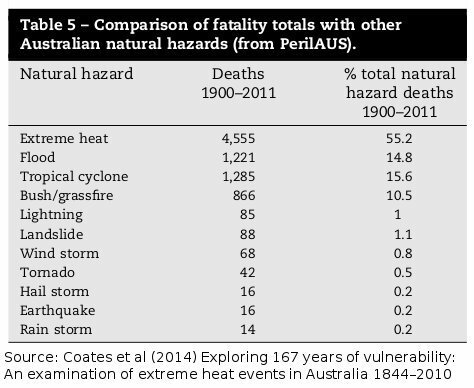 Deaths due to heat events exceed all other extreme weather causes including bushfires, and the trend is going to get worse as temperatures rise with climate change unless we can mitigate some of the worst impacts and learn to adapt what we can’t mitigate. Can I suggest Ms D’Ambrosia that a big first step would be to read that Victorian Auditor General Office report on Heatwave Management for Victoria? We need to have better governance in place and this should start with our representatives in parliament. It is part of their duty of care to ensure safe conditions for citizens of Victoria. And heatwaves exacerbated by the climate change trend, definitely pose a risk to health, especially to many vulnerable groups in the community. Once they understand the impacts maybe they will increase their flimsy climate policies, released on 26 November without any fanfare. Rivalry is not unknown between the Council areas of Darebin and Moreland with the valley of the Merri Creek that divides the two municipalities. But we also share many similar cultural aspects and levels of development and many of the same issues and problems. We will also feel the impacts of climate change in a similar manner through increased frequency and intensity of heatwaves and hotspells. 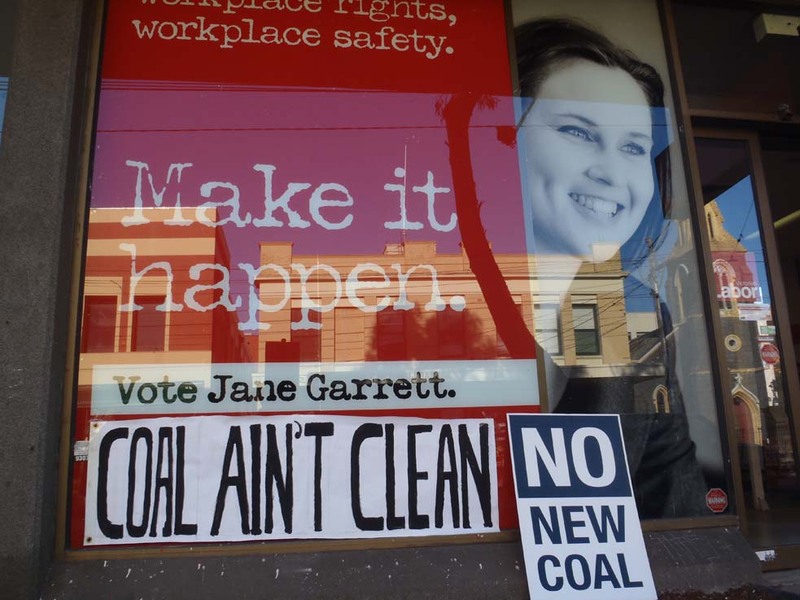 Like in Brunswick, Northcote has an interesting story this election with Climate Action Moreland’s equivalent grassroots activists in Darebin Climate Action Now playing a pivotal role. Like in Brunswick, the seat of Northcote is one of those inner northern city electorates in Melbourne where the Greens vote has been steadily growing. This state election it has proved to be a particularly nasty battle-ground between the ALP’s Fiona Richardson (Unipollwatch profile) and the Greens Trent McCarthy (Unipollwatch profile) with the intervention of Federal Labor MP David Feeney into the fray. 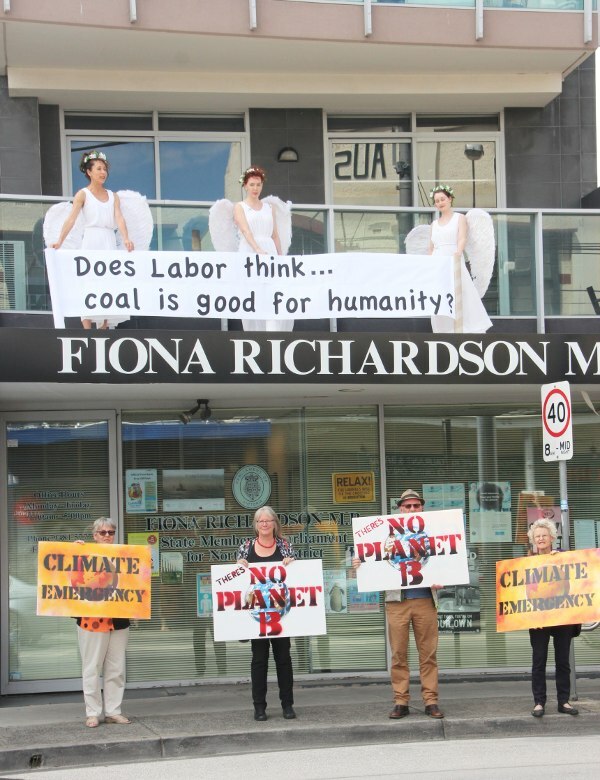 Both the Liberal and Labor parties have avoided talking about climate change in this election and Northcote is a good example of this bipartisan silencing of debate on climate policy. Candidates from both major parties refused to attend a Climate Q and A forum in the electorate on November 12. The group that organised this forum, Darebin Climate Action Now is an active group that has been quietly talking about the issue and impacts of climate change in this community for a number of years educating voters bit by bit. We think climate issues are important for the state election on November 29th for the citizens of Moreland. Here are the meet the candidate forums so far organised in Moreland covering the electorates of Brunswick, Pascoe Vale and Broadmeadows. Attend them to meet the candidates, Don’t be shy, ask questions. With the Federal Government effectively in denial on climate change, being shunned at the United Nations for our pitifully weak targets, and supporting expansion of coal exports. The Baillieu/Napthine State Government has also been backtracking on climate mitigation by: restricting wind farms, closing energy efficiency programs, reducing the solar feed-in tarriff to 8c per Kilowatt hour, allocating more brown coal licences, only a temporary ban on fracking and CSG to June 2015, building an $8 billion East West Link tollroad we described as climate madness, and no current State target to reduce carbon emissions. The Liberals repealed the 20 per cent by 2020 target the Brumby Government set in 2012. 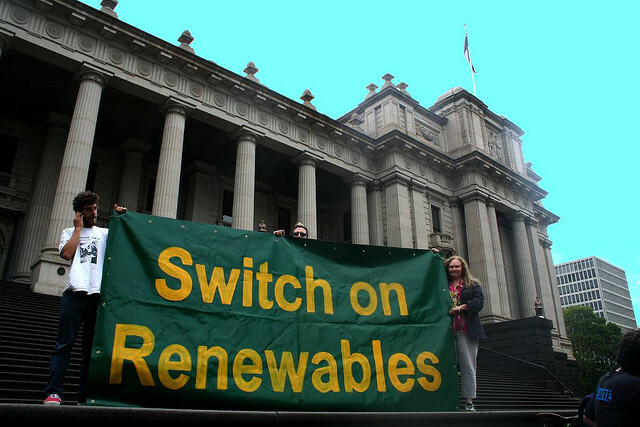 Surveys have repeatedly found citizens of Victoria want action on climate change. Our local Moreland Council are leading in tackling climate change by achieving carbon neutrality in 2012 and setting a community emissions reduction target of 22 per cent by 2020, setting in place a process to divest from fossil fuels, establishing heatwave strategy and urban planning, tree planting and trialing cool pavement technologies to combat the urban heat island effect. We should demand equal climate action leadership from our state government representatives, Please attend. Listen. Ask Questions. Join the discussion. Brunswick Candidates Forum. Brunswick Uniting Church. 7.30pm.